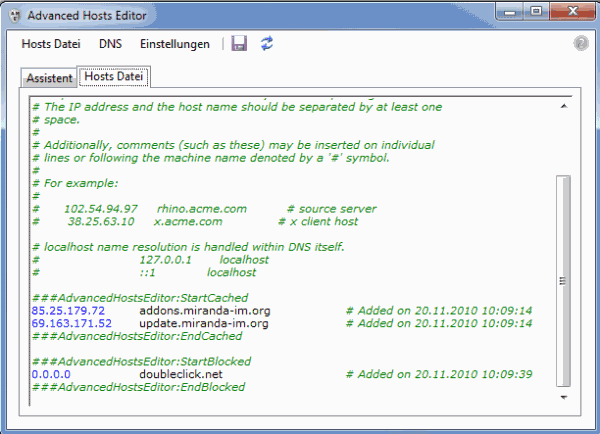 The hosts file in Windows can be used to override DNS look-ups. I have described one practical use for webmasters who want to work on sites before in the DNS propagation article. The hosts file is used for ad blocking, blocking of hosts that may be malicious or dangerous, or speeding up connections to select sites by eliminating the need for DNS look-ups. I do not want to get into details on how to edit the hosts file, as I have done that already in another article: How To Edit, Reset The Windows Hosts File. It is relatively uncomfortable to add, remove or edit large lists of hosts in a text editor. Software often offers better manageability and sometimes even additional features like flushing the DNS cache or optimizing the hosts file by removing duplicates. All programs mentioned in this overview are freeware, most portable that require no installation. Hosts Manager has been around for a very long time. It is one of the most sophisticated, feature rich programs for hosts file editing. It's feature set include everything one could be looking for, from downloading popular hosts lists from the Internet, over hosts file optimization, removing duplicates, to editing the hosts file easily and backing things up. It is possible to use multiple hosts file lists from the Internet and merge them into one big list sans the duplicates easily with Hosts Man. A new software program that adds the option to run multiple hosts file on a system. Users who work with Host Profiles can switch between different hosts files. This basically replaces the existing hosts file with another file. 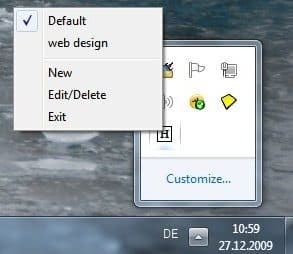 One possible option would be one hosts file for web development, and one for general Internet surfing, or browser specific hosts files. The editing capabilities are limited to plain text editing. 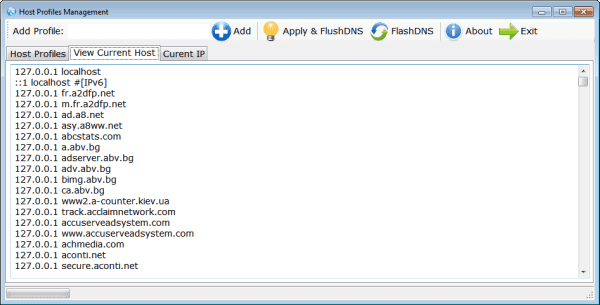 The program has controls to flush the DNS cache, and to display the current hosts file. The program offers some of the best editing capabilities of all hosts file managers. Problem is that it is currently offered as a beta version which does not play well with large hosts files. Users will get an unresponsive window when they try to load the program for the first time. Advanced Hosts Editor is well suited for users with a hosts file that has a few hundred entries. The software displays all hosts and websites that have recently established a connection with the computer, which makes it an effective tool for users who want to add servers to their hosts file while they are using the Internet. The hosts file size limitation is the biggest drawback of the application. HostsXpert is a regularly updated hosts file manager that offers editing and handling of the file in Windows. 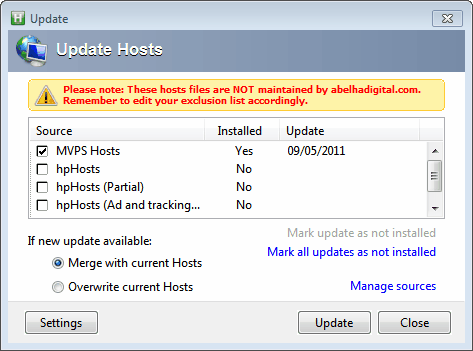 It supports backup and restoration of the hosts file, and can download a popular list from MVPs and HP. Editing is not as straightforward, everything is displayed in forms which means it takes longer to edit multiple entries than it would be in programs that display the entries in a text editor like interface. Update: The program has not been updated since 2011. Hosts Manager can be used to switch between multiple hosts files in Windows. The program is not an hosts file editor, which is probably the biggest weakness. It is also the only program that requires installation and the Microsoft .NET Framework 3.5. 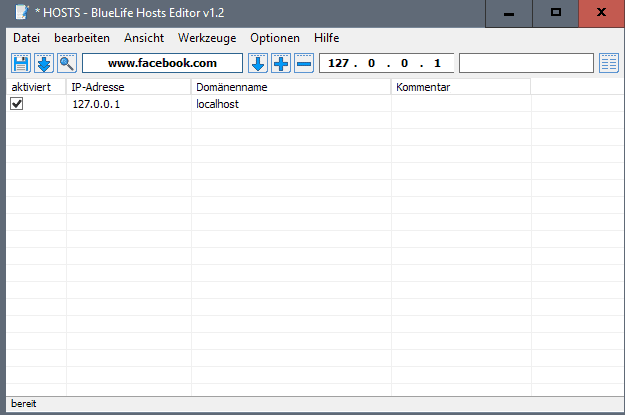 BlueLife Hosts Editor is a free program for Windows that you can use to edit the hosts file on Windows machines. One interesting feature that it ships with is the ability to enter a domain name to resolve it to an IP address, to add the IP address to the hosts file. The program loads the active hosts file on start, and offers options to load and save hosts lists. What it does not offer is options to load existing hosts file, e.g. those for ad blocking, anti-malware or other purposes. Did we miss a hosts file software? Let us know in the comments. An overview of hosts file editors and programs for the Windows operating system that improve the editing and managing of the hosts file. I find AdMuncher to be more updated and reliable than Hosts file. Great article I’ve used Hosts man along side ad blocks plus for a long time now and rarely see any ads. oh and TRY AdMuncher is commercial so not really relevant in the comments of an article about freeware programs. IMHO, the Treewalk DNS server + Confetch combination is still the best. Terrine, unfortunately, as discussed elsewhere on the website, using the HOSTS file to block Microsoft telemetry spying WON”T work, as Microsoft is transmitting the data out of the computer over encrypted channels. The HOSTS file can block unencrypted http traffic, but it cannot block encrypted https traffic. The encrypted channels Micorosft is using for its telemetry spying bypass the HOSTS file completely. Thus, the only way to block the Microsoft telemetry spying is to block the individual domains either in your software firewall, or your hardware (router) firewall. There are system tweaks and registry and Group policy edits which can disable some, but not all, of the Microsoft telemetry. Also, there is a small free program from Safer Networking called “Spybot Anti-Beacon” which claims to do this with only a few clicks.